Hey everyone, in today’s episode, I share the mic with Chris Coyier, the founder of CSS-Tricks, CodePen and Shop Talk Show. 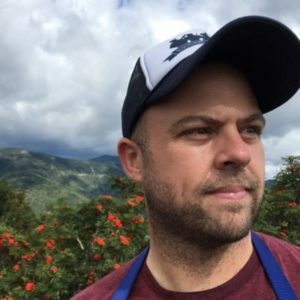 Listen as Chris shares the numbers (revenue, page views and listeners) for all his businesses, the most important thing he’s learned when it comes to building a community, why sponsored posts are the best revenue generators for him, and the difference between failing and giving up too soon. Being nice to others goes a long way when it comes to building a community. Creating unique content that is of great value will result in page views for your website. Being consistent is key when it comes to growing your business and community. Chris Coyier: Anything that would make a good story about building websites, we go for. In fact we had a crazy one where I had a hacker really mess with my life, and I even took that as an opportunity to- I invited the hacker onto the show anonymously to have an interview. Voiceover: Do you want to impact the world, and still turn a profit? Then you're in the right place. Welcome to Growth Everywhere. This is the show where you'll find real conversations with real entrepreneurs. They'll share everything from their biggest struggle to the exact strategies they use on a daily basis. So if you're ready for a value-packed interview, listen on. Here's your host, Eric Siu. Eric Siu: Before we jump into today's interview, if you guys could leave a review a review and a rating, and also subscribe as well, that would be a huge help to the podcast. So if you actually enjoy the content and you'd like to hear more of it, please support us by leaving us a review, and subscribe to the podcast as well. Thanks so much. All right, everyone, today we have a guest that I haven't spoken to for five years, since my Treehouse days, his name is Chris Coyier. He is the founder of CSS-Tricks, CodePen, and the Shop Talk Show podcast. Eric Siu: So there we go. So, Chris, how's it going? Chris Coyier: Hey, thanks so much for having me on, Eric. Yes it has absolutely been a long time. We worked together for sponsorship stuff from old team Treehouse. Glory days. Eric Siu: Yeah. So how are things going nowadays? And I guess we can start off by, why don't you just tell us your story first of all? Chris Coyier: Sure. I mean, that's all coming back to my head right now, just because we talked about it a little bit. My life isn't actually all that different from five years ago, really. So, some people know me through CSS-Tricks, if you know me at all, because I've just been running that site, it's been a decade now. It started in 2007. And it's like a web publication about all things web. So the name is really dorky, you know, "CSS-Tricks." Whatever, I was a young man when I chose it and it just is what it is. It's certainly about CSS. I woke up today and wrote an article about CSS and published it. Or a couple of them, actually. And so that's what it is. Maybe you land on it in Google search results, or maybe you're a subscriber because you just like hearing about what's new on the web, what's new in CSS stuff, but it's not limited to that topic, necessarily. The topic is building websites. And that topic, for CSS-Tricks, is kind of the topic for my life, really. Because I also run CodePen, which you mentioned, which we can talk about but it's kind of a playground, if you would, for front-end development. And I have a podcast as well, called Shop Talk Show, and it's all about building websites, also. So like all the Chris Coyier: It's a lot of me, but I have part-time writers. I have Jeff, and Robin, and Sarah. They kind of just do whatever they want. Like, maybe I'm not the best boss in that regard. We do keep like a Trello board full of ideas, and me as well, but it's like if something appeals to you on that Trello board, then go for it. Or if you've read an article recently and it resonated with you, go ahead and throw up a link to it. But don't just link to it. You shouldn't link to something unless you have something to say about it, your own opinion there, you can summarize it in a good way. I don't really mandate what other people write, necessarily. If someone comes to me and is like, "I need some ideas." Well, sure, I'll shoot you ten ideas. But I almost prefer that it wasn't an assignment, that I didn't put you on a beat, and you had to do it because this is your job. I'd prefer it to- "This is what I'm interested in right now, so this is what I'm going to write about." And it's a slow trickle. We only publish one or two things a day. Eric Siu: How many articles are you putting out a month, yourself? Chris Coyier: A month? I don't know, at least 20 I'd say. And sometimes full-blown tutorials. Sometimes it's a video. Sometimes it's a snippet or an almanac entry, because those are different concepts on CSS-Tricks. For example, the almanac is more like an encyclopedia of CSS. It's not as timely, whereas the blog is by nature, things are dated, and it's kind of in chronological order by published. You read it more like a publication. Whereas snippets are, they're dated and it says when they were last updated, but they're just kind of filed into a particular category. Because it's not a full-blown tutorial, it's just like a bit of code. Eric Siu: What does the average word count look like for you? Eric Siu: Ten thousand's a lot. Chris Coyier: Yeah, that would be a lot. It would be like a big, thick chapter in a book, I feel like, right? Or maybe an entire book in some cases, if it's a small one. We don't tend to do that. Nor are they two paragraphs, usually. But there are these two types of posts. There's a normal, traditional blog post, and then there's a link post, which are by nature shorter, because it's- We're not trying to get you to stay on our site very long. We're trying to link off to somebody else. Eric Siu: How long does the usual post take you? Maybe I can make an estimate. So the business model for CSS-Tricks is, there's some merch. That's nothing. We almost lose money on that. There's display advertising, which is okay. Sponsored posts, which is pretty good. I like those because it gives me a chance- It uses the mechanism that we already have, which is content, and then we mark them clearly and stuff. And that seems to be going okay. And then the best thing you can do is to have a full site sponsor with a custom deal. Eric Siu: Cool. And so how much are you making on CSS-Tricks a year? Is it 500K? Less than a million? Over a million? Chris Coyier: It's much less than a million. And in fact, like my personal take-home is pretty low. It's a little over 100, maybe. Chris Coyier: Yeah, and I don't mean to scoff at a hundred thousand dollars. That's a wheelbarrow of money, it absolutely is. It's just not- I'm not, whatever. I'm not buying a yacht from CSS-Tricks, that's for sure. But I do have other things as well, which are similar. There's CodePen, too, which is a bigger project. I mean, page views-wise it's triple CSS-Tricks. Eric Siu: So 21 million page views a month? Chris Coyier: I think it's more like 15, 16, but that's without embeds. Which, embeds go on other peoples' sites. That's kind of tracked differently, which is a similar number of them. Eric Siu: By the way, side note. Before you talk about CodePen, one of our main developers was hired from CodePen, actually two of them came from CodePen. They're really, really good. They're so solid. One's from Singapore, the other is from I think Sweden. So, yeah. Really great site. So why don't you talk about CodePen? What is it exactly, and how does it help people? And pre-dating CodePen there's tools like JS Fiddle, JS Bin, great tools that kind of Chris Coyier: That's really great. Eric Siu: It just takes time. That's the thing with it. So, you clearly know how to build communities. We should just call you the master of communities. So, I'm looking at this, and I'm trying to extrapolate the numbers a little bit. So, basically you're saying you're doing one to two blog posts a day on CSS-Tricks, right? So if you average it out, that's about maybe 45-ish blog posts per month. Would you say you did that consistently for ten years? Or how many years was that over? Chris Coyier: Yeah, well I can just look right now. We have 2725 posts since CSS-Tricks right now. So, what is that? Eric Siu: 27 blog posts a month? Chris Coyier: So yeah, it's more like one a day, it's averaging out to over all the time, it sounds like. It doesn't count screen casts, it doesn't count almanac, it doesn't count snippets. So there's all these- When you add all those in, I think we're a little up over. Eric Siu: Four or five thousand? Chris Coyier: Yeah. Well, there's 1400 pages just alone. So I don't know, whatever. I like how into the numbers you are. It's kind of fun for me, too. Eric Siu: So, we'll share all these numbers in the show notes. I'm going to switch gears a little bit. How old are you right now? Eric Siu: 36. Okay. And what's one piece of advice you'd give to your 25 year old self? Chris Coyier: 25 year old self, wow. What was I doing when I was 25? I think I lived in Portland, Oregon, I think? I'd just moved there for the first time leaving home. I went to college and stuff, but I'd never left- I grew up in Wisconsin. What did I- What had I screwed up then? You know, it probably wouldn't even be like tech, or business. It would probably be like, "You should go for a run a little more often, buddy. Why don't you get the bike out? Why don't you make a healthy meal tonight?" Eric Siu: What's one new tool you added in the last year, that's added a lot of value? Chris Coyier: We use Zoom, which is kind of- I don't know that it's new, but it's kind of new to me. Because you need to talk to people face-to-face on a remote team. We'd be like, "Let's do Google Hangouts for everything." And then Slack had a thing that you can kind of use, and then we used- God, what's the other popular one? I don't even Voiceover: Thanks for listening to this episode of Growth Everywhere. If you loved what you heard, be sure to head back to GrowthEverywhere.com for today's show notes and a ton of additional resources. But before you go, hit the subscribe button to avoid missing out on next week's value-packed interview. Enjoy the rest of your week, and remember to take action and continue growing.